Cobras are the only team from Russian Far East (including both men’s and women’s teams) which participated in national level tournament. 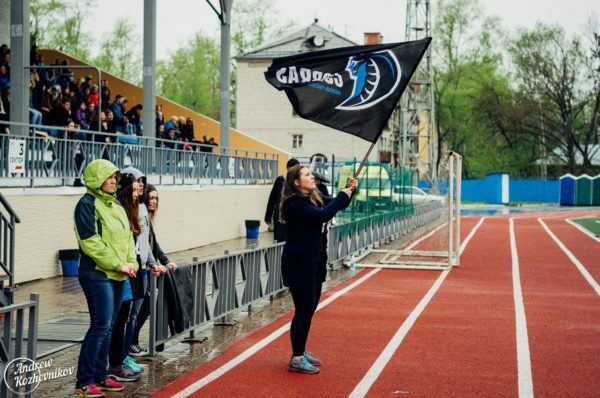 Khabarovsk team took part in two Russian Cups, every time flying for 8,000 km and showing cheerful and bright football. Meanwhile, on the sideline of Cobras team you can see specialist from the United States who is equally cheerful and bright. 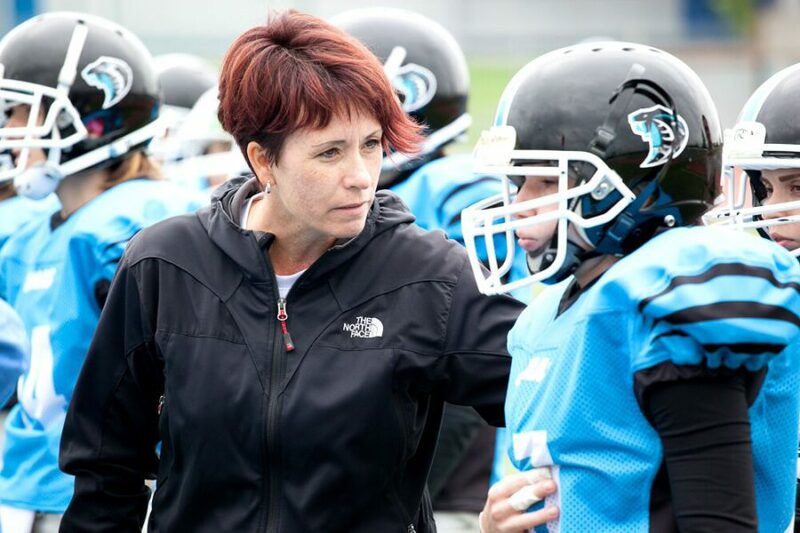 First & Goal talked to Tasha Poduska and initially asked about her passion to football. I played volleyball and soccer at the University level and I played, flag football and tackle football in a casual league level. I love watching the sport of football and I have since I was 8 years old, I live for Sunday football and in the USA I would go to a sport bar with 15 TVs or I would bring all the TVs in my house into one room so that I could watch as many games as I could at one time. I can’t imagine a life without football. In every team you’ve played for you played №13. Spite omens? I just love the number 13 and I always have, I don’t believe in omens, I think you make life be what you want it to be. You’ve already had coaching experience, haven’t you? Under what circumstances did you come to the Cobras? I have given several speeches and conducted several interviews since living in Khabarovsk, in every article and interview I say, “I could easily live in Khabarovsk if there was Mexican food and American Football”. 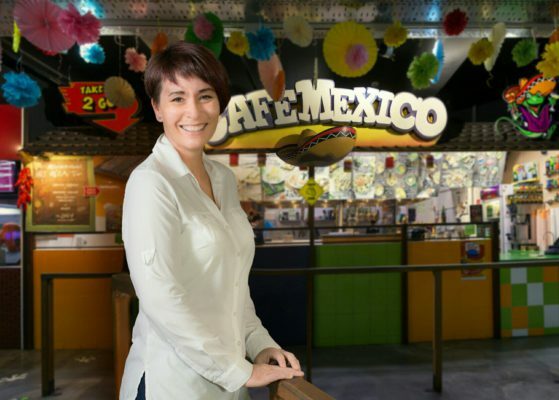 Since I opened my own Café Mexico in Khabarovsk, I know have as much Mexican food as I want and the Cobras Women’s Football team asked me if I would help the team, I was extremely honored and happy to help. Do you have there any «Lost in Translation» situations? Is there some intermediate between you and the team – coaches, captain or just guy who speaks English well? No, my players don’t speak English, they understand my broken Russian/American English Football language. I have a great General Manager that assists me with the management of the team and a great captain. We have a PR manager as well and we run our football team similar to a business. We have big plans, so we have to be very organised. People say that you are obsessed with order, very emotional, very energetic and not very fond of when somebody do not agree with you. Which of these is closest to the truth? I think I’m more obsessed with planning than order, I like to make a plan, watch how it works, then make adjustments and watch how those adjustments work. If you can get everyone to follow the same plan then you can be very successful. I gave our team their off season workout plan 3 days after we returned from the Moscow tournament I don’t know about being every emotional, I think I’m more military like and demanding, but I don’t think I’m emotional. I do have a lot of energy and passion. People can disagree with me and dislike my plans, opinions or ideas, as long as they have a suggestion, plan, idea or opinion of their own. I dislike people who dislike something with no reason or people that are unwilling to try new things. In a nutshell – what football do play Cobras? What are team’s features? Did you work on playbook yourself? Last season yes, this season, no, coaches from America are helping me. Do you take football tactic tips from you American friends? Yes, I’m going to two coaching clinics in the US this March and I have a coach that looks at my roster and assist me on which defense and offense would work best for my team. I also send them video of my Quarterback, Running Back and Wide Receivers for input and critique. As we see in league of Finland or training camps in the USA, the Russian girls often don’t have big size and weights. They have to improve the technique and tactical training more than others. Do you agree? 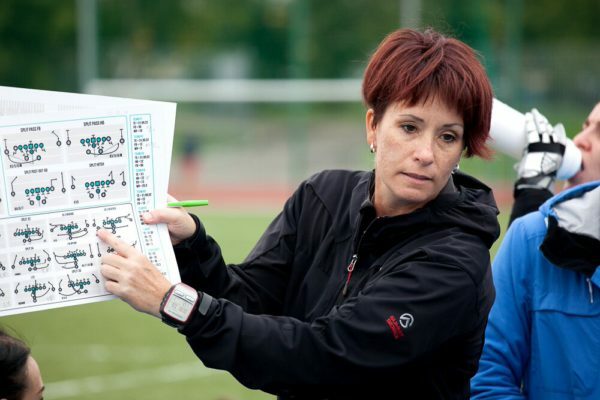 I agree, I don’t think we will have big girls like the USA and European countries have, I think we will have to rely on speed, technical adjustments and tactical training to contend overseas. And what about psychology? Are Russian girls harder or easier to work with? This is a difficult loaded questions — Russian girls play with the biggest heart and are fearless. This is good and bad because football is a contact sport. I find that Russians want to do everything quickly. If they want to get from point A to point B and there are seven steps in between, the Russian may try step one and then jump to step 6 because they don’t feel they need the steps in between. In football you can’t do this, you need to train your body in the off season, heal, add weight and strength. Then you need to spend hours and days and months on technique. It’s a slow process and most athletes want immediate results. In the USA we understand this, we grow up with football and we don’t know any other way of playing football, we have a set season, transition and off season. Over time Russians will adjust to this, as a coach it’s my responsibility to prepare them physically to be able to play the game and avoid injury. Russians will give you everything though, they will run and play until they collapse, I don’t know that I’ve had American athletes that could give this kind of effort. The fact that most of the Russian players here learned the sport through the internet, watching games, youtube, etc. this is very impressive. My team has players who have never played a sport in their life and they come and play with us and fall in love with football. I love my team and I love teaching them football. Let’s recall visits with the Cobras to Moscow. Did you have similar extreme road trips at home? If you are referring to “at home” as in the USA, then no, we would never play in the format that we played in Russia. Football is an exhausting sport and most teams play 1 game every 5 to 7 days. The fact that we played 2 games a day for 2 days straight is very risky and physically harmful. 1 game a day would be difficult. I know that football is not a popular sport and stadiums are expensive. Since we come from Khabarovsk to Moscow we would prefer to start playing a team from another city on Thursday, a team from a different city on Friday, and then compete against St. Petersburg on Saturday and against a Moscow team on Sunday. Maybe a pick up game on Wednesday prior or Monday. Obviously as the sport becomes more popular in Russia, different Cup formats will be considered. Here in the Far East we have a lot of teams in Guam and the Phillipeans, and one in Japan. We are trying to get more competitions in our region before coming to the Moscow Cup. Could you evaluate the level of the best Russian team – the Valkyries? Is it possible to compare them with American women teams? 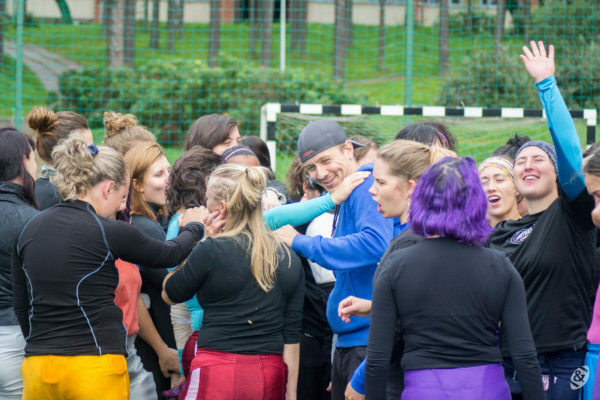 Valkyries are a great team and they are helping our sport grow throughout all of Russia, I admire them and respect their program a great deal. Their coaches have helped me and my players a lot. I know that some of their players are attending football camps in the USA and getting an idea of the level of competition in the USA. I think the speed of the game in the USA is at a much higher level than it is here. It will be difficult for any Russian team to compete in the USA if they don’t always play at this high level speed. The speed of the defense and offense is seconds faster than our game and a team needs a lot of practice playing at this speed. The European teams don’t compete at this level or at this speed, so I don’t know how Valkyries can train for a USA competition. Did you manage to talk with Bobby Rome when he worked with the Wild Pandas? And with the head coach of women’s Russian national team Ilya Kravtsov? Ilya has helped me a lot and the fact that he speaks perfect English is amazing. I’ll be attending his National Team Camp at the end of March and I’m really looking forward to learning more from him. He knows how to build an organization, not just a sport. He is so kind and giving, Women’s’ Football in Russia has grown through his endless contributions. Do you help someway another Khabarovsk team Legio? May be training process or consultation? I’m always willing to help, if I have the knowledge and ability. The more I learn, the more I try to share. We have 5 teams here in the Far East – Wild Panadas, Vladivostok, Legio and Eastern Warrior, Khabarovsk and Steel Wings and Black Grizzly, Комсомольск-на-Амуре. Hopefully the sport will continue to grow in popularity so that they can organize a league and compete in the LAF somehow. In new season Legio is likely to participate in LAF (men’s Russian Championship). Did you watch broadcasts oh this tournament? The final match? I don’t know enough about LAF and what is required by Legio to compete in the LAF, if there is any way possible for Legio to compete, I know that they would be ready and love the opportunity. I did watch a lot of matches via the internet this year and I love men’s Russian Football. The teams are well trained and play respectfully, which is very important to the growth of the sport. I watched a delayed broadcast of the final match and it was a very exciting final quarter. What team did you support during Superbowl? In regards to this year’s Superbowl, my heart was for the Falcons and my mind was for the Patriots, but overall it was the greatest Superbowl ever. As a super fan of the sport, this is what you always wish for, that the Superbowl will be the final battle between the two best teams and it finally happened this year. The whole world watched one the of the greatest games ever played. And what team are you rooting for generally? My team in the Minnesota Vikings, I have watched them and supported them since 1978. I have jerseys and a lot of fan gear from this team. They have made supporting them at times difficult, but they are my team and I’ll stay with them until the end. Now they have a new stadium so I can’t wait to see it. You run the chain of restaurants of Mexican food. What is signature dish there? Burritos and quesadillas, our food is Meixican American so Russians really like it, a lot of sour cream and sauces. Any discounts are available there for the Cobras? Do you know the meaning of surname of one of your players – Perchenko? What is your favorite dish of Russian food? Finally can I ask you about your attitude towards the new US president. I think any good American should respect the office of the President, I am a supporter of President Trump and I believe he will do great things for the United States if the government and supporting bodies will support him. He is in a difficult position, but he is a brilliant business man with a lot of experience, so I think he be able to handle just about anything.